Before I discuss our wonderful weekend with The Team, let's talk Prom. 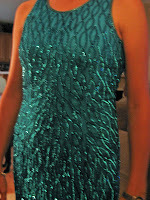 While I'm sure that Cat Deeley's dress is not vintage Gantos, it sure looks like my Senior Prom dress. Does anyone remember Gantos? At the Galleria, second floor by Deck the Walls? If you couldn't find it you could just follow the trail of sequins and beads. Bad shots and lighting aside, I think it looks pretty similar. The lighting of my dress looks more teal in the picture, but it's really as blue as Big Cat's. I guess I could have dug through boxes and found my old Prom pictures...maybe later. 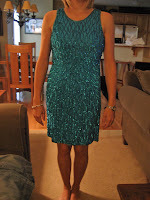 I also had shoes dyed to match and matching sequins on the toes. Because there just wasn't quite enough sequins on the top half of me. Wow. What a vision. Too funny-I don't remember that store. Do you still have your matching shoes? of course! you wanting to borrow them?? ?